People are all about hauling other people and things around these days, hence everyone throwing their money at crossovers and SUVs. But not every vehicle protects passengers equally. Before you go out and buy a new midsize SUV, you should probably know how well—or poorly—some of them hold up in a crash. The Insurance Institute for Highway Safety, or IIHS, recently destroyed eight different SUV models in the name of crash-protection awareness for the front passenger. 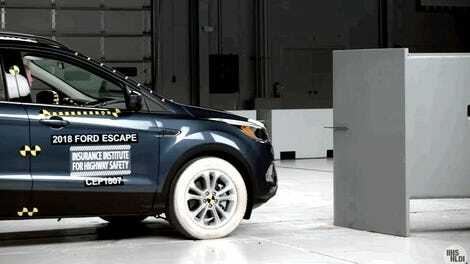 IIHS has four ratings for how well a vehicle holds up in crash tests: good, acceptable, marginal and poor. Six of the eight midsize SUVs got one of the top two ratings for the institute’s passenger-side small overlap test. The other two, the 2018 Jeep Grand Cherokee and 2018 Ford Explorer, got the lowest rating: poor. It’s easy to see why. 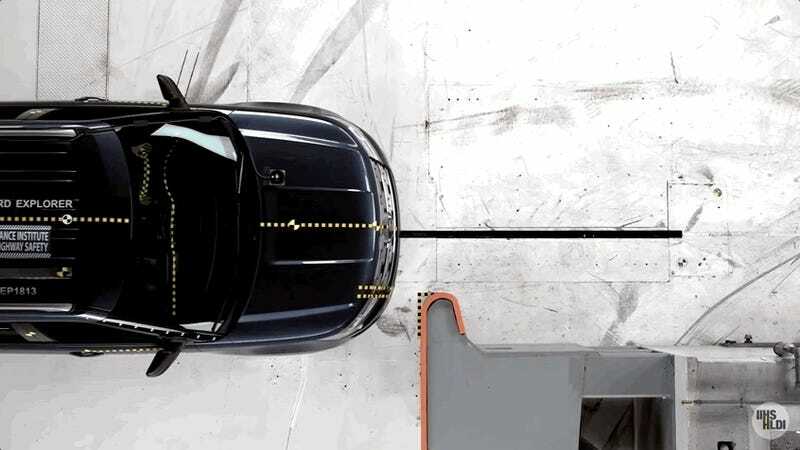 The passenger-side small overlap test mimics a vehicle hitting something like a tree or a post at 40 mph, with a quarter of the car’s front end hitting the object. IIHS just recently started doing the test on the passenger side, in attempts to get automakers to give front passengers the same protection as the driver. Of the eight midsize SUVs IIHS rammed into objects for the passenger-side small overlap test, the 2019 Kia Sorento, 2018 Volkswagen Atlas and 2018 GMC Acadia got the top overall rating, good, in terms of protecting the passenger. The 2018 Toyota Highlander, 2018 Nissan Pathfinder and 2018 Honda Pilot got an acceptable rating, and no vehicles tested got a marginal overall rating. The Grand Cherokee and Explorer were where things got ugly. Intrusion reached 15 inches at the lower door hinge pillar and 13 inches at the upper door hinge pillar and the dashboard. The door sill was pushed in 6 inches toward the dummy. Measures taken from the dummy showed a high likelihood of injuries to the right hip in a real-world crash of the same severity, as well as a possibility of left lower leg injuries. The Jeep Grand Cherokee had maximum intrusion of 10 inches at the lower door hinge pillar. More alarming was what happened to the passenger dummy’s head. It hit the dashboard hard through the front airbag and then, because the side curtain airbag didn’t deploy and the door opened, it moved outside the vehicle during rebound. Measures from the dummy indicated that right leg injuries would be likely in a crash of this severity and a head injury would be possible. Shotgun? Nah, someone else can have it.